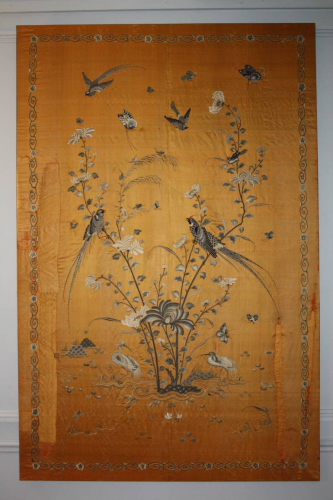 An impressive and beautifully hand embroidered silk textile on gold/yellow silk. c1920 and made in China for the European market. The silk has been mounted on a panel stretcher so it can be hung on a wall. Depicting birds of paradise, butterflies, insects and smaller birds amongst chysamthemuns, roses and other flora and fauna. The stitching colours are a mixture of grey shades as well as dark blue and black. Such a work would have taken many days and hours to complete especially as there are many different types of stitches which create the texture and slight 3 D effect of the piece. A true work of art and craftsmanship. There is a long section of gold/yellow silk which has been repaired from the original piece - without removing any of the embroidery. A stunning wall piece for any room.